Watch: President Obama Sings 'Amazing Grace' In Eulogy : It's All Politics The president spoke for more than 35 minutes at the funeral of the Rev. Clementa Pinckney and ended by singing with attendees. 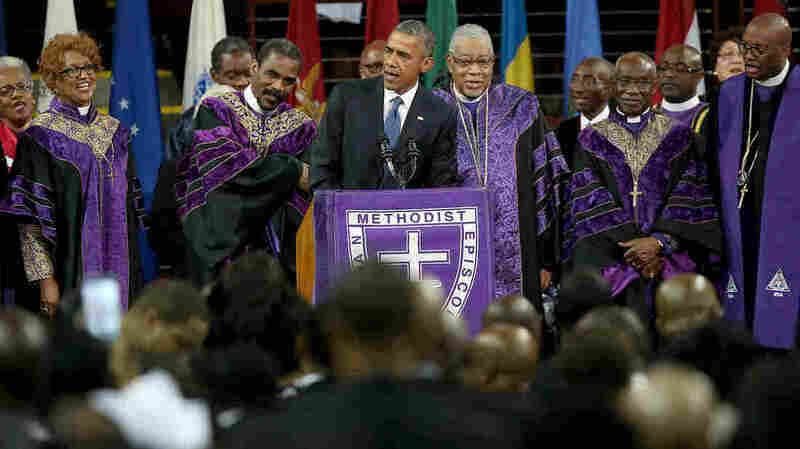 President Obama sings "Amazing Grace" while delivering the eulogy for the Rev. Clementa Pinckney on Friday. President Obama gave a rousing speech Friday at the funeral of state Sen. and Rev. Clementa Pinckney, one of nine people shot at Emanuel AME church in Charleston, S.C., earlier this month. The president spoke for more than 35 minutes about the reverend's legacy and teachings, and Obama said that he had spent much of the week reflecting on grace. The man accused in the shootings, 21-year-old Dylann Roof, "failed to comprehend what Rev. Pinckney so well understood: the power of God's grace," Obama said. He also praised the victims' families for responding to Roof in court "in the midst of unspeakable grief with words of forgiveness." Obama called the Charleston shooting "an act that drew on a long history of bombs, arson, shots fired at churches. Not random, but as a means of control, a way to terrorize and oppress." He ended his eulogy with a song — he led the attendees in part of "Amazing Grace," at first alone and a cappella, then joined by the crowd (at 36 minutes, in the video below).